Ralphs makes a new weekly ad similar to that of Kroger. 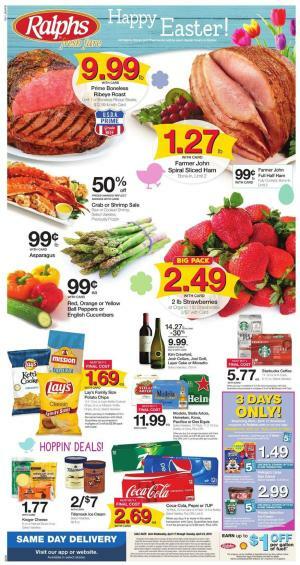 CLICK HERE TO SEE RALPHS WEEKLY AD 13 MAY 2015. 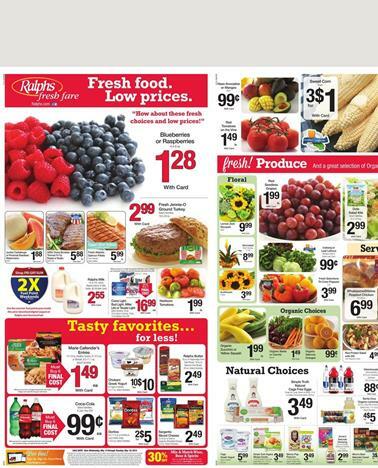 Ralphs Weekly Ad 13 May 2015 offers fresh groceries on the cover. 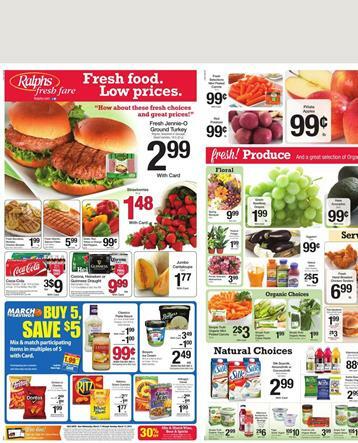 Find grapes, dairy products and meat on the first page of the whole weekly ad. Blueberries and Raspberries are sold at $1.28 with card.Tomatoes and chilli varieties are featured on the cover page as well. Fresh Jennie-O Ground Turkey $2.99 with card. Ralphs Milk $2.55 with card. Dairy products and some of popular packed simple meals are also available in the cover page of the latest Ralphs Weekly Ad 13 May 2015. Corn 3 for $1 with card. Deli products, chicken varieties and organic choices are available on the same page as well. Organic choices are yellow squas, organic beets or carrots, organic valencia oranges. Seasonal food is very important range of products becuase they got the freshest food in the correct season. Otherwise it is mostly added with something or they got additional hormon to grow them faster. You can find the true quality of fresh food in the seasonal grocery. Kroger Ad and Ralphs Weekly Ad products are shared in the preview page and I also want you to read this post to know some of the good deals from both great supermarkets. Fresh meat, grocery, fruits, organic food and many more of these are available in this week, too. In cover page of Ralphs offers our favourite meat product with discount. Digital coupons are available in the officia page of the Ralphs. Spend a great time with your family in Mother's Day. So does Kroger ! Kroger got seafood, meat, bread and fresh food are focused. This week great shopping is waiting for us. Meat products, some of the juices, breakfast products and Lipton Ice tea pack. /Ralphs Weekly Ad. Whole beef tenderion $11.99 lb. USDA Choice trimmed tri-tip roast or steaks $6.88 lb. See many more of these weekly ads to get the best savings with Weekly Ads. Prices of Ralphs Weekly Ad published in 8th April are effective through 14th April. Latest Ralphs Organic Food weekly ad prices are available on pg; 2. Ralphs offers organic food featuring prices you will absolutely love ! These prices are effective until 14th April. Viewable deals of Ralphs are featured on the preview which you can find with the links on this post. Organic Red Tomatoes on the vine $1.99 lb. Organic food is not all. Ralphs Weekly Ad offers great products in this "lookbook". You can find out fresh produce, butcher shop, digital coupons, simple truth products on pg; 5, outdoor furniture on last page. Cool items to have in your garden are featured with perfect prices. Also see other ads with the pages on main page. They got brilliant features on these weekly ads. Don't miss out these products below which you can find on this ad. Examples of meat products from the Ralphs Weekly Ad. Save more and get top quality meat products from Ralphs. Angel Food Cake $2.99 with card. Fresh seafood on pg; 3. California Grown Hass Avocados $69 with card. Foster Farms Split Chicken Breasts $88 lb. with card. Wild-Caught sockeye salmon fillets $8.99 lb. Check out fresh food products of Ralphs weekly ad. Fresh products of grocery section of Ralphs with these high quality products is your primary choice. Strawberries 2 for $5 with card. Red Tomatoes on the Vine $1.49 lb. 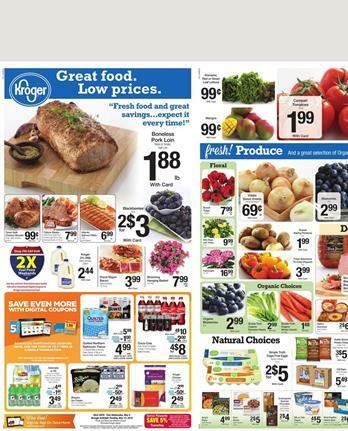 Find Ralphs meat prices on pg; 3 of weekly ad. Butcher Shop offers new meat meals. On the same page find deals of every aisle. Also see seafood. Moreover Simple Truth food products like whole chicken is also available. Jumbo Arichokes 2 for $5 with card. Fresh hand-breaded chicken tenders $6.99 lb. Simple Truth Natural whole chicken $1.99 lb. Ralphs help earth get rid of dangerous contaminants. You can find environment-friendly products on pg; 5. Earth day is 22nd April and Ralphs will do some good for the people who care about the earth we are living. Actually these are better for everyone whether they care about it or not. Because they are healthier and Ralphs Weekly Ad offers good prices for them. Ralphs offers a lot of products for Easter and March. 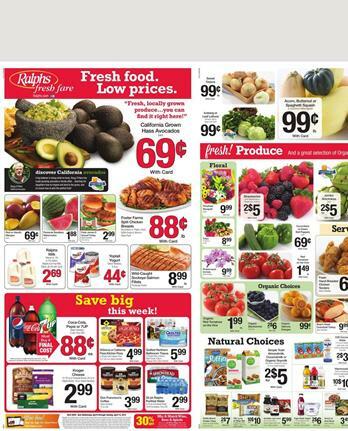 You can find Ralphs weekly ad 11 March preview. Click the image to see full sale of the weekly ad. Ralphs weekly ad 11 March deals will be a great chance to save your money. Shop for the best products you can find on the internet. Ralphs weekly offers can be your reason to shop at the supermarket for great prices. With new Ralphs ad you can shop for healthy organic food and a fine selection of meat products. On pg; 2 of the latest ad you can see fresh products. Deli products consisting of delicious and healthy choices of American farms. First page to view a nice product selection from deli department. Some of the deals are picked from various aisles. You can find a nice product range of the Ralphs on pg; 3. Cosmetics, personal care products, cleaning supplies, household items and more different items are featured on that one. To shop for general needs and save while doing this Ralphs is a very nice place to go. These catalogues are wonderful help to save on this kind of shopping. Also see service deli and bakery products, organic products, St. Patrick's Day savings, mix and match sale until 17th March. Shop for the best while keeping your money in your pocket.